Roger Federer continues his quest for his fourth Miami Open title on Monday when he will take on Filip Krajinovic from Serbia. Krajinovic reached the 4th round this year at Indian Wells and is hoping to equal that performance in Miami. Prior to the Federer match, Petra Kvitova will face off against Caroline Garcia. Her best result to date in Miami is a quarter final appearance in 2014. Kvitova can achieve the world number 1 ranking if she wins the title on Saturday. The last day session match on Stadium court will see world number 2 Simona Halep take on Venus Williams. Halep’s best showing in Miami was a semifinal appearance in 2015. Venus has hoisted the Miami Open trophy on 3 prior occasions. The night session will feature Frances Tiafoe versus David Ferrer followed by Karolina Pliskova versus Yulia Putintseva. The customary sentiment when one is 19 years old and sees a living legend across the net as the opponent is panic. By the time, the realization has set that it is an actual competition, the score line usually reads something like 0-6 with the first set evaporating in less than half an hour. Frances Tiafoe may be young, but he demonstrated a maturity today that will serve him well in the future as he faced the 18 time majors champion, Roger Federer. 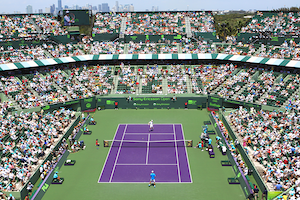 Although the Swiss master penned another in the win column, he was tested by the teenager in his 7-6, 6-3 victory in the second round at the Miami Open. Ranked 101, Tiafoe worked his way into the main draw by qualifying. Then, he prevailed in the first round to earn his date with the reigning Australian Open champion. In the opening game, the American gave a nice account of himself, not getting frazzled after a 40-love lead dwindled to 40-30. With a nice backhand down the line winner, Tiafoe kept the proceeding on serve at 2-1. Federer kept his cool in the eight and tenth games, serving consecutive love games to put the set on an even footing twice. Later, it was Tiafoe’s turn to get comfortably to 6-5. When the former world number one saw a breathtaking backhand winner whiz for 0-15, he did not blink. Ultimately, Federer pushed the set into a tiebreaker with an ace. From that point on, Federer’s experience shone. Subsequent to securing the first point and mini-break with a volley winner, Federer cruised to capture the set. After surrendering the first set with a bevy of unforced errors, Tiafoe rebounded by seizing the first break chance in the match to start the second set. However, his joy was ephemeral as Federer created two chances of his own and shortly leveled the set. Another testy moment in the contest was the fourth game. With three miscues, Tiafoe dug himself a 0-40 hole. The youngster shoveled himself out to reach 2 all. Yet, soon his next time serving the American stared at 15-40, Federer applied the accelerator to grab the break. The Swiss promptly sealed a love game with an ace to consolidate and move ahead 5-2. Still, for Tiafoe, there was no let down as he held serve and forced Federer to earn the win. The world number six did so with an easy service game. With possibly, 14,000 sets of eyes watching, this is the biggest stage that Tiafoe has been on up to now. When Federer deferred and asked him to serve, admittedly, it amped up his anxiety level. “At first, I think he was feeling my game, didn’t know what to expect I think”. When asked what is the primary lesson to take from this encounter, Tiafoe cited that he is encouraged by the way he played and that the goal will be to work hard on his game so that the next time he encounters such a big name it won’t be as early in the tournament. What does he feel he could improve “my return game”. Since the American pinpointed at least one aspect of his game which requires improvement, that alone is progress. It’s an all American ladies’ line up on Stadium court at the Miami Open on Thursday as second round action gets underway. World number 3 Karolina Pliskova opens play on center court against American Madison Brengle. Later in the afternoon, 2012 Miami Open semifinalist and former world number one Carolina Wozniacki battles another American Varvara Lepchenko. The night cap has reigning French Open champion Garbine Muguruza taking on Christina McHale. With the former Spaniard by way of Venezuela, it should be an electric evening on Miami’s main show court. On the men’s side, 19 year old American qualifier Frances Tiafoe tussles with Russsian Konstantin Kravchuk in his first round match. 20 year old promising Croatian Borna Coric precedes Tifae’s match as he squares off against Spanish veteran Marcel Granollers. Novak Djokovic’s slayer in the second round at this year’s Australian Open, Denis Istomin, faces Russian Andrey Kusznetsov. Still, the day belongs to the women undoubtedly as 2012 Miami Open Champion Agnieszka Radwanska hopes to get back on track with a victory over China’s Qiang Wang. Australian Open 2017 semifinalist Coco Wandeweghe tries continue her wonderful 2017 with a deep run in South Florida. She takes on qualifier Jana Cepelova. Newly minted Indian Wells titlist Elena Vesnina starts her quest for the double crown as she looks to breeze through against Ajla Tomljanovic. Click here for Thursday’s complete order of play.